The Middletown Insider: St. Jude Children's Research Hospital - Go, Shon, Go! 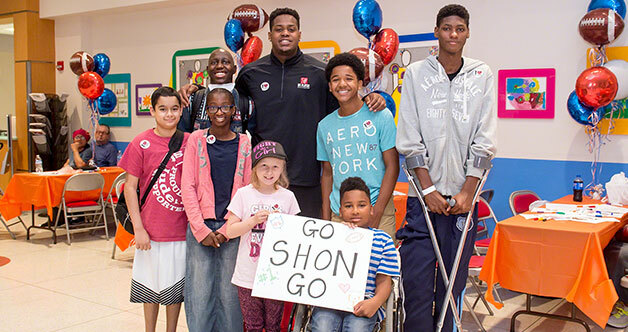 St. Jude Children's Research Hospital - Go, Shon, Go! Shon's future was planned out: college football at Auburn, then a career in the NFL. But, when he learned he had cancer, Shon's dreams were put on hold. Read Shon's story. St. Jude patient Kyle had a brilliant idea the month before completing treatment for a cancerous tumor. Read Kyle's story, and find out how he gave back to the hospital that he felt gave so much to him. See how an Illinois community of 6,000 rallies each year to raise funds for the children of St. Jude. ALSAC President and CEO Richard C. Shadyac Jr. celebrates the volunteers and donors who never stop supporting St. Jude, even during summer. Check out new summer shirts and polos at the St. Jude Gift Shop. Every item purchased benefits the kids of St. Jude. You can help win $1 million for the kids of St. Jude. Vote St. Jude as your favorite charity today!